After completion of the preflight checklist and cabin door closure, the relief crew Captain, who had been at the boarding door greeting passengers, returned to the flight deck. He informed me that a clerical error had been made in the passenger-to-bag match and that he had chosen to close the main cabin boarding door. I expected that we would get a call on the radio or via ACARS if there was an actual mismatch between passengers and their bags. As we waited at the end of the runway for our takeoff clearance (about 45 minutes), one of the relief crew members commented that the bag match must be OK since we hadnt been advised of any problems via radio. I concurred, thinking that the arrangement had been for Ground Operations to call if there was true mismatch. It appears that I was mistaken, as the Station manager states that a positive bag match was not accomplished. I believe the problem was caused by a modification of the normal chain of events. While the bag match is an extremely important check, it is not on our preflight checklist, because the boarding agent does not close the last cabin door until the bag match is complete. Since we check doors closed on our Before Start checklist, we have assurance that bags and passengers match before we start engines. What I failed to realize, however, is that if anyone other than the boarding agent closes the door, our normal checkpoint for the bag match is lost. I suspect that cultural behavior differences may also have contributed to this problem. It now seems highly unrealistic to expect a respectful [foreign] employee to radio a Captain to argue about his bag match decision...and to direct a return to the gate... I am convinced that I must become directly involved in all unusual events and discussions pertaining to aircraft ground operations and to solicit input from all involved personnel. Another incident reported to ASRS points to the value of clear communication between the cabin crew and flight deck when passengers are observed behaving strangelywhether or not they have yet created problems. At FL330 had momentary [warning] message Door Left Aft Cabin, meaning door 2L was not fully latched. Message cleared itself, then reappeared. (Got message a total of 4 times.) Contacted purser to have her ensure no one was tampering with door. She said there was a female passenger who had been acting very strangely since leaving [airport]. Purser was sent to check, and to latch door. Passenger had been seen in the aft galley area near the door. Through an interpreter...passenger admitted to having attempted to open door. [Crew] found 2 [company] pass-riders and had them sit with/watch over passenger for remainder of flight. Contacted company and asked for flight to be met by the FBI. I emphasized that the passenger was at least unstable...and clearly should not get on our [next] flight. This event clearly highlighted the advantages of a large infrastructure and excellent communications available at my...airline. Late-boarding, panicky passengers are a headache for every gate agentand a potential security problem, too. The moral of this Captains story: "Always question if in doubt; some passengers will do anything to catch a flight." Pushback had just started. The ground crew (pushback crew) asked me if I would take another passenger. I said sure, OK. They started to pull me back to the gate, when I noticed a passenger run up the jetway stairs from the ramp onto the jetway... Was this one of our employees to be able to come from the ramp? About the time I questioned who this person was, the Station Manager was telling the pushback crew not to come back and continue pushing the aircraft. A new agent in the jetway and the passenger were waving us to come back in. This created some confusion. But since the security of this passenger was questionable, we left him and continued on our way. On follow-up, I found that this passenger had been arrested for breach of security to get access onto our ramp. He had darted down another jetway onto the ramp in an attempt to catch our flight. The new agent had not recognized what happened and was trying to help this passenger. The Station Manager and my own question about security kept us from violating a very serious security situation. ASRS is receiving more and improved information from maintenance personnel since the issuance of customized reporting forms for this community in 1997. From "creative" repairs to troubling trends, here are highlights from some recent maintenance reports. While reviewing aircraft log book, noted discrepancies with Item #54, an interim repair. Inspected First Officer clear view window and noted toilet paper had been used with sealant around half the First Officer window. This is the interim repair and deferral for follow-up maintenance. ASRSs resident maintenance guru tells us there are several approved methods in the maintenance manual for interim repair of cockpit window pressure leaks. None include toilet paper in the materials required. I was servicing all three engines and serviced #1 last as it was the last one shut down... I was thinking about returning the oxygen cart that was needed for servicing the aircraft. Because I was distracted by that thought, I forgot to secure the oil cap. Because the door on the cowl was down, I thought I had capped the tank and secured the door. I then returned the oxygen cart with the flatbed. Six minutes later the next aircraft came into the gate. Approximately 15 minutes later I went to service all engines on that aircraft. I then saw the oil cap and contacted the lead [mechanic], who contacted Maintenance Control. During inspection found right nose tire worn to limits. 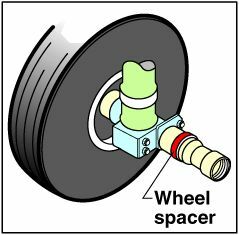 While removing wheel assembly from axle, spacer or washer that fits between axle nut and outer wheel bearing 'stuck to' removed wheel assembly. The rebuilt Color wheel assembly was installed w Color ithout spacer. The removed wheel assembly was rolled to stores shipping area, then trucked to wheel shop where it [spacer] was discovered still affixed to the bearing. Line maintenance was notified and aircraft was taken out of service to reinstall this part. Contributing factors to this situation may be the type of grease (adhesiveness) which had been changed a while ago and/or the grease seal which grips and forms a tight seal around the edge of the spacer. Use of work cards, which provide step-by-step instructions for routine parts installations, can help technicians detect when spacers have gone AWOL. This excellent report from a CFI involved in a loss-of-separation incident at an uncontrolled field describes some of the crew coordination issues at stakeand potential hazardswhen two CFIs fly together. This was a training flight where I, the pilot flying, was getting checked out in a new aircraft...by another CFI. While I was doing the flying, the pilot not flying was handling all the electronics. We were both looking out for other traffic and making radio calls. Unable to get a response from UNICOM we decided to land on Runway 22... On taxi back there was a fair amount of chatter on the UNICOM and the pilot not flying turned the volume down on the radio. We performed our before take-off check and looked for traffic on final, base, and downwind for Runway 22. We did not turn the volume up on the radio (some takeoff check) nor did we announce our departure. While on the takeoff roll, the pilot not flying suddenly grabbed the controls, only to release them again allowing me to continue the takeoff, but pointed out [another aircraft] on short final for Runway 10! We were well past the intersection prior to his touchdown, but this was just a little too close. There were a number of factors leading up to this incident. First and foremost, the concept of "See and Avoid" was not practiced. Unlike what I teach my students, we only checked the pattern we were using and did not accomplish a 360 to check the whole area... Nor did we have the radio volume turned up. This was another factor. There is no excuse for not monitoring UNICOM or announcing our intentions. Probably the most important factor, I feel, was the delineation of who actually was PIC and who was to do what. Though I was "sole manipulator of the controls," I assumed the role of student and expected/relied on the other CFI to assume all responsibility.. It is truly scary when two CFIs fly together.